Ecodsoft Keylogger could record and log all the computer activity, working in stealthy mode and completely invisible. It could not only record key stroke but the software informations such as applications launched, websites visited, and popular Instant Messenger log, including Skype, MSN, AIM, ICQ, Facebook, etc.. So it could be excellent parent control and surveillance tool and also could work as a employee monitor. Record and monitor all activity of your computer and save for your reference. Intel Pentium III 350MHz or above.512 MB RAM or above. ...... Ecodsoft Keylogger will also track the launch of applications, sent emails, visited websites, and save information typed in the forms. 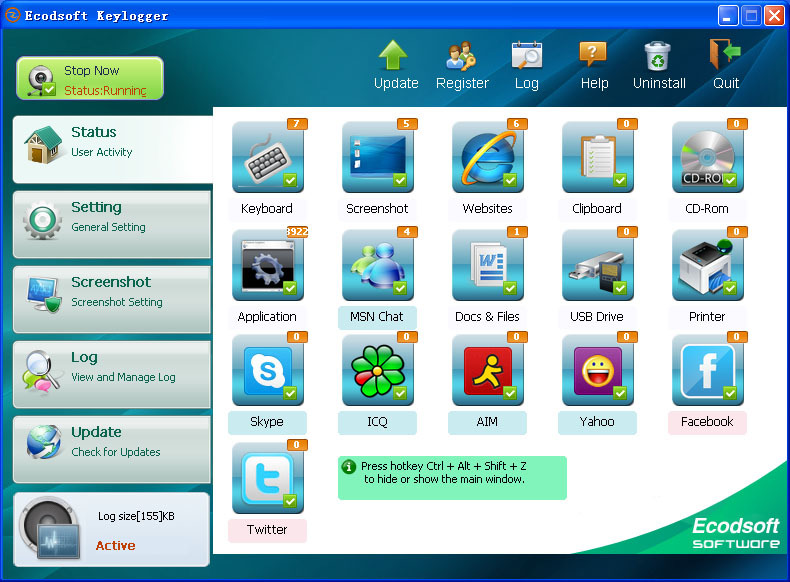 Now you could free download Ecodsoft Keylogger and try it! This free keylogger logs everything you type. You will never lose a password! Qweas is providing links to Ecodsoft Keylogger 2.3.16 as a courtesy, and makes no representations regarding Ecodsoft Keylogger or any other applications or any information related thereto. Any questions, complaints or claims regarding this application Ecodsoft Keylogger 2.3.16 must be directed to the appropriate software vendor. You may click the publisher link of Ecodsoft Keylogger on the top of this page to get more details about the vendor.